The global topical pain management therapeutics in sports medicine market is highly fragmented and competitive, says Transparency Market Research based on a recently published report. This is because of the presence of a large number of entrants who are competing to stay on top. 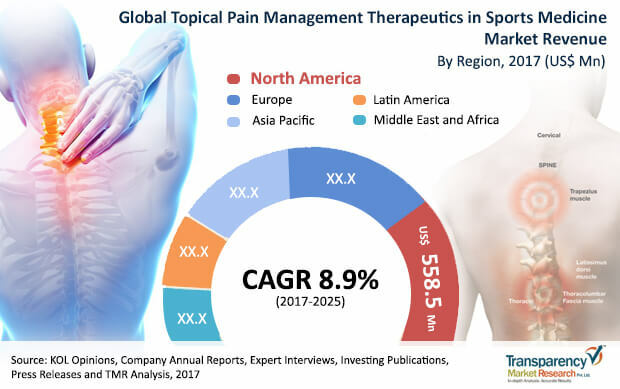 In the near term, the global topical pain management therapeutics in sports medicine market is expected to observe an escalated challenge with the passage of various emerging players. In order to stay ahead in the global topical pain management therapeutics in sports medicine market, some of the key players are seen focusing on collaborations, and strategic mergers and acquisitions. They are also investing a considerable amount of money into R&D for better products. Deploying such approaches, some of the firms holding dominant positions in the area are GlaxoSmithKline plc., Endo Pharmaceuticals Inc., Beiersdorf AG, Johnson & Johnson Services, Topical BioMedics, Inc. According to a report by TMR, the topical pain management therapeutics in sports medicine market was valued at US$1,400.0 mn in 2016 and is projected to reach US$2.97 bn by the end of 2025. Further, it is envisaged to expand at a steady 8.9% CAGR from 2017 to 2025. Based on the therapeutic class, the global topical pain management therapeutics in sports medicine market is segmented into analgesics, anesthetics and skeletal muscle relaxants. Analgesic segment is expected to hold the highest share of the market in the forthcoming years. This is due to shift of patient’s preference toward topical therapeutic treatment for acute injuries due to the inconvenience associated with oral drugs. North America and Europe will be leading the topical pain management therapeutics in sports medicinemarket in the upcoming years. This is due to a rise in the number of sports injuries in U.S, approval of novel products from US FDA, increase in sports participation in Europe developed healthcare infrastructure, high prevalence of the diseases in the region etc. Further, the Asia Pacific topical pain management therapeutics in sports medicine market is also emerging. This is due to proactive initiatives by governments encouraging adolescents' participation in sports activities. Pain is a distressing feeling which is usually caused by intense or damaging stimuli. Pain is most prevalent symptom associated with most of chronic conditions. Pain management involves the employment of medications or analgesics and therapies to treat several pain conditions. Whenever, these medications are applied directly to the skin they are known as topical pain relief. These analgesics include non-steroidal anti-inflammatory drugs, anesthetics, capsaicin, tricyclic antidepressants, ketamine, clonidine, opioids, and cannabinoids. These medications are present as creams, ointments, gels, and transdermal patches. They are mostly available as over-the-counter (OTC) products while some are available through prescription only. The growth of the global topical pain management therapeutics in sports medicine market is majorly driven by increase in prevalence of arthritis and other bone-related conditions. Another factor boosting the topical pain management therapeutics in sports medicine market includes rise in adoption of sports medicine products. As they cause lesser side effects compared to oral pain relief, upsurge in geriatric population across the world, and increase in demand for topical pain relief by sports players. Topical pain relief medications can cause irritated skin and they have a strong odor or unpleasant smell hamper the topical pain management therapeutics in sports medicinemarket growth. Conversely, the development of online platforms for topical therapeutics and a high potential in untapped markets in the emerging economies are expected to provide lucrative growth opportunities for the topical pain management therapeutics in sports medicine market.